278 pages | 5 B/W Illus. Jihadism, Foreign Fighters and Radicalization in the EU addresses the organizational and strategic changes in terrorism in Europe as a result of urban jihadism and the influx of foreign fighters of European nationality or residence. 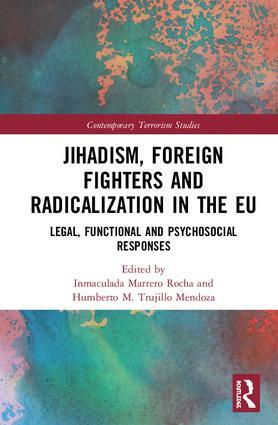 Examining the different types of responses to the treatment of radicalization and its consequences in the recruitment of young urban fighters and jihadists, this book offers a framework for understanding the process of violent radicalization.It critically analyses political and legal responses that have taken place within the European framework, whilst also examining a series of functional responses from social and behavioural psychology. This book then goes on to develop an explanatory model from an economic standpoint, exploring the need to adapt the fight against the financing of terrorism to the changes in the sources of financing jihadist cells and foreign fighters. Furthermore, the volume draws on experience from the prison sector to assess the process of radicalization and the possibilities of intervention. Taking an interdisciplinary approach, this book will be of great interest to students of terrorism and counter-terrorism, radicalization, European politics, radical Islam and security studies. Inmaculada Marrero Rocha is Senior Lecturer of International Relations at the University of Granada, Spain and Executive Director of the Euro-Arab Foundation for Higher Studies. Humberto M. Trujillo Mendoza is Professor of Behavioural Sciences at the University of Granada, Spain.